The bad news for me didn't end with Charlie's departure. While my high school issued grades only at the end of each semester, it issued progress reports at mid-term. I got mine that fall (1982). Dad wasn't pleased. He immediately revoked my driving privileges. No problem. I could deal with that. Inconvenient, sure. But my driving privileges were revoked with regularity (and later reinstated) each time my grades came out. Dad, however, took it to another level: he also restricted me to the house on school nights. In effect, this meant that I couldn't go to meditation on Wednesday nights at the new San Jose Center. I was upset, obviously, but I didn't go ballistic at that moment. In part, I had a sense that things would work out. I took comfort in Swami Yogananda's story. He, too, faced pressure from his father to pay more attention to his studies. 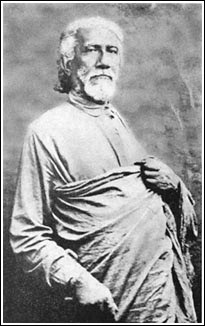 While Swami Yogananda was uncompromising in his devotions -- despite his father's pressure -- Sri Yukteswar (pictured) promised him he'd graduate from college as long as Yogananda did the minimum and sat for his exams. Another reason I didn't immediately blow my stack at dad's new edict was that I had something to look forward to that weekend and I had an immediate way to strike back. First off, I had been scheduled to take the SAT exam that Saturday. As far as I was concerned, that was now off the table. While I wouldn't tell dad, there was no way I would sit for that exam. Second, Joy Days were scheduled that weekend. Joy Days was a monthly occurrence amongst the California disciples. Each month the disciples were encouraged to descend upon one of the Centers in the State (either in San Diego, L.A., Santa Barbara, San Jose, or San Francisco) for a weekend of fun and camaraderie. Guru really encouraged the idea and Joy Days were typically attended by the more enthusiastic disciples. As a rule, I really enjoyed Joy Days and that month they were held in San Jose for the very first time. So, I'd secretly stick it to dad by bailing on the SAT and, instead, enjoy myself at Joy Days. That would also give me time to figure out how to solve my dilemma about Wednesday night meditations. Just like Swami Yogananda, I could count -- I thought -- on some kind of Divine intervention. As expected, Joy Days was great. I was out of the house for most of the weekend and when I saw dad on Sunday afternoon, I happily reported to him that "the SAT wasn't as hard as I thought it would be." He seemed pleased until he saw me headed out the door again about an hour later, showered up and in my meditation whites. "Where are you going," he asked. "No you're not. You have school tomorrow." Gulp. He was right. It had never occurred to me. Sunday was, technically, a school night. As I stood there in the doorway, realization dawning on me, I could no longer contain myself. I blew my stack. In my anger, I promised dad that when I graduated high school the following June, I'd be out of his house immediately and permanently. I stalked upstairs to my room in a rage. The final blow came a few hours later. I got a phone call from one of the disciples. He said that Guru had called the Center that night after the meditation and had spoken to each person individually. I hung up. Cried in frustration. Then began planning.